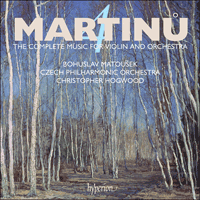 This recording is the last volume of a four-disc survey of Martinu’s complete output for solo violin and orchestra, including compositions with other solo instruments. They are performed here by the orchestra in which Martinu played the violin, the distinguished Czech violinist Bohuslav Matoušek who is one of the foremost living exponents of this music, and conductor Christopher Hogwood. Martinu’s Violin Concerto No 1 was written for the celebrated Polish-born American violinist Samuel Dushkin. Although immediately appealing to the performer, its premiere was delayed due to the volatile European political situation in the thirties, and the score was lost during World War II when Martinu was forced to hide his autographs in Europe and flee to the USA. The score was discovered in 1968 and the work did not receive its premiere until 1973. It is a dazzling, virtuoso work, revealing the influence of Dushkin’s violin playing, especially his liking for technical display. The Violin Concerto No 2 is different from its predecessor both stylistically and in terms of its fate. It was commissioned by Mishca Elman (1891–1967), a famous American violinist of Ukrainian origin. The work’s main characteristics recall the qualities of Elman’s playing, notably his unique sound, his preference for noble and elegant melodies, his exceptional feeling for the sonority of his instrument, his love of slow tempos, and his rich use of rubato and portamento. Bohuslav Matoušek demonstrates his great versatility in idiomatic performances of these contrasting works. Martinu’s Concerto No 1 for violin and orchestra H226 (recte H228/233, originally H232 bis) has a very complicated story. In the early 1930s Bohuslav Martinu was already well established in Paris, where he had arrived from Prague in 1923. He became a highly respected composer with performances of his operas, ballets, orchestral works and chamber music in several European cities as well as in the USA. His music earned awards and he was commissioned to write new works by both musicians and music institutions. Since it was well known that he originally played the violin (for some years, indeed, as a member of the Czech Philharmonic), it was only a matter of time before he received a commission for a violin concerto. The commission came from the celebrated Polish-born American violinist Samuel Dushkin, the man who in the summer of 1931 inspired Igor Stravinsky to compose a violin concerto, and was supported by the publisher Willy Strecker, the owner of the Schott publishing house. This was at the time when Schott negotiated an exclusive contract with Martinu, which would have placed the composer among an elite group of composers with such a comprehensive publishing deal, alongside the likes of Paul Hindemith. (This explains the large correspondence between Martinu and Strecker, which helps us to trace the creation of his violin concerto virtually step by step.) Only the rise of the nationalist socialist politics in Germany with their aversion against the so-called ‘degenerated music’ prevented Schott from fulfilling this contract. Martinu knew Dushkin from Paris, where they both lived in the early 1930s. He was present at Dushkin’s performance of Stravinsky’s violin concerto with the composer conducting. However, it seems that Martinu’s desire to write a concerto for Dushkin came independently, since on 22 May 1931, before Stravinsky started to work with Dushkin, he had already mentioned in a letter to Willy Strecker that he planned ‘to work with Mr Dushkin on a violin concerto’. Four months later, on 24 September 1931, Martinu confirmed to Strecker that he had spoken to Dushkin and was ‘ready to start composing the violin concerto’. On 9 December 1931, the day after his forty-first birthday, Martinu reported to Strecker that the concerto was ready and that he was ‘going to look over it with Mr Dushkin’. From this remark it is obvious that Martinu did not yet appreciate Dushkin’s idea of cooperation on a new musical work. Dushkin was famous for taking an active role in influencing the composers he worked with. While for Stravinsky, a pianist, this was very welcome—he noted in his autobiography that Dushkin’s availability for advice was a factor in his undertaking the violin concerto—for the violinist Martinu this was a new experience and caused a lot of difficulties. However, on 27 October Martinu was still quite hopeful. He wrote to Strecker that ‘the work on the concerto continues very well, Mr Dushkin is very contended’. For a composer who was used to writing quickly—in 1931 he finished twelve compositions and worked on the ballet Špalícek—it must have been a nightmare to return again and again to a piece he regarded as being completed. More than fifteen months later, on 8 February 1933, Martinu wrote to his relatives in Policka that he had done ‘a lot of work on the concerto for Dushkin’. Eight days later he reported that he had finished the work, and that Dushkin was ‘very happy’ with it. Dushkin took the new concerto to the USA, where he sought opportunities to perform it—‘very soon, probably in Philadelphia’, according to Martinu (in a letter to his mother on 9 June 1933). However, this proved overly optimistic, as we can see from the composer’s letter to his family in Policka of 27 June, where he says that ‘Dushkin will return from the US in August and would like to do a final revision of the concerto’. At this time Martinu’s close friend Stanislav Novák, the leader of the Czech Philharmonic under Talich, revealed his interest in performing the concerto in Prague, but Dushkin refused to give permission as he wanted to do this himself. In September Martinu reported that Dushkin had returned to Paris and that they were to undertake ‘the definitive editing of the concerto’. A few days later it looks as if Novák’s interest in performing the work stimulated Dushkin, and Martinu reported to his mother that ‘Dushkin is going to perform the violin concerto in Prague, probably in January’. Schott were advised to send the fee for the concerto to Paris, which indicates that everything was at last reaching a conclusion. But again nothing happened, probably because of the political upheaval in Germany in 1933 and 1934. Other proposed premieres of the concerto with Dushkin, including a performance at the New German Theatre in Prague in the autumn of 1934, were not realized. Four years later Dushkin prevented Louis Krasner from performing the work in the United States (according to a letter from Martinu to Strecker on 4 March 1938). Probably during World War II, when Martinu was forced to hide his autographs in Europe and flee to the USA, the score of the concerto was lost. It was discovered by Harry Halbreich in 1968 in the Moldenhauer Archives at the Northwestern University of Spokane (Washington). It was not until 25 October 1973 that the concerto received its premiere, in Chicago, with Josef Suk as the soloist and Georg Solti conducting the Chicago Symphony Orchestra. The first movement, Allegro moderato, reveals the influence of Dushkin’s violin playing, especially his liking for technical display. The short orchestral opening, centred on E, introduces the short syncopated motivic ‘cell’ (as the composer described it), which comprises six notes, five of them being E in different registers (with a short D being the other note). The solo violin takes up the main cell in a bravura passage full of double, triple and quadruple stops, harmonics and other virtuoso techniques. In the course of the movement the most significant elements are long passages written out in full triple stops and bright arpeggios. Martinu reveals his intimate understanding of the violin and his knowledge of the virtuoso violin literature he learned to play as a young boy in Policka. It is difficult to separate out his own background expertise and any special wishes of Dushkin, although it seems likely that the passages where the violin almost imitates a guitar demonstrate more of Dushkin’s ideas than do the lyrical and melodic passages, which are typical of Martinu’s output. Quite unusual for Martinu is the vast space he gives to the variations of the opening cell. It is not until the middle of the movement that he introduces a contrasting motif, in a mild E minor, where the violin sings in one long phrase a melody of outstanding beauty and simplicity, in the style of a Moravian folk song. To underline the change of mood, the accompaniment changes from a full orchestral staccato to tremolos in the strings. At the end of this extremely short (just 22 bars) but important section the melody of the solo violin is joined by a solo cello. The following reprise returns almost literally to the material of the opening section, first in A minor before finishing in the home key of E minor. The second movement, Andante, is built on a broad cantilena, stylistically very close to the contemporaneous folk-ballet Špalícek H214. Its pendulum-like melodic line is based on the alternation of a central tone with upper and lower notes, mostly at the interval of a fourth. The closing movement is an Allegretto (although this designation does not appear in the original manuscript and was assigned by the concerto’s editors, the violinist Josef Suk, the conductor Zdenek Košler and the Dvorák scholar Jarmil Burghauser). It starts attacca with a short main thematic cell. As in the first movement this is very short, here consisting of just five notes, with four of them being A (the other note is a B flat), but this time not distributed in different octaves. Melodically, the opening orchestral section continues the Špalícek-like character of the second movement. The entrance of the solo violin, however, with its richly ornamented writing, again bears Dushkin’s stamp. Its simple melodic line is decorated with several appoggiaturas. This is interrupted surprisingly quickly by a series of short solo cadenzas for the violin, and in one of these Martinu combines the solo violin in a highly original way with the snare drum—he returned to this distinctive timbre years later in the last movement of the Suite concertante H276 (also commissioned by Dushkin, see volume 3) as well as in his Phantaisies symphoniques (Symphony No 6) H343. The Violin Concerto No 2 H293 is different in every respect from its predecessor, stylistically and in terms of its fate. It was commissioned by Mischa Elman (1891–1967), a famous American violinist of Ukrainian origin, a former child prodigy and student of Brodsky in Odessa and Leopold Auer in St Petersburg. Although born just two months later than Martinu, Elman gave his Berlin and London debuts before the composer even entered the Conservatory in Prague. Miloš Šafránek, a friend and fiery supporter of Martinu, reports in his biography from 1944 that Elman attended a concert of the Boston Symphony in Carnegie Hall in early January 1943 hoping to hear Shostakovich’s seventh symphony, but walked instead into the New York premiere of Martinu’s Symphony No 1. After the overwhelming success of this symphony, which made Martinu famous in the USA almost overnight, Elman visited the composer and asked him to write a violin concerto for him. This must have been an interesting meeting, since it is difficult to imagine a bigger contrast between the activities of the soloist, focused mainly on repertoire of the eighteenth (Vivaldi, Bach) and especially the nineteenth centuries (Beethoven, Schubert, Wieniawski, Tchaikovsky, Dvorák), and the composer, who had been based in Paris, one of the most important centres of contemporary music. It is not surprising that the paths of Martinu and Elman had not previously crossed. In the programme of the premiere of the Violin Concerto No 2 Šafránek recalls the circumstances of their first encounter: ‘Martinu’s monosyllabic manner was puzzling to Elman, who tried to break the ice by inquiring if he had heard any of the living world-famous violinists. “No”, was the reply. “Are you by any chance familiar with my playing?” ventured Elman. “No”, said Martinu flatly. There was a prolonged silence. Finally Elman tried to resolve the situation by taking Martinu to his studio and playing to him for half an hour or so. The composer listened very attentively, though with complete impassivity. After the last note Elman, very naturally, stood and waited for his reaction. But Martinu continued to sit in sphinx-like silence, which remained unbroken until he got up to leave and the two musicians bade each other an awkward goodbye. The violinist was completely baffled, and feared his scheme must result in failure. Before long, however, Martinu duly appeared with the finished score of a new violin concerto.’ This anecdote is supported by several other artists—Louis Moyse among them—who reported similar experiences in their dealings with Martinu. Martinu composed the concerto in just two months, from 23 February to 26 April 1943, in his home in New York City. The work’s main characteristics recall the qualities of Elman’s playing, notably his unique sound, his preference for noble and elegant melodies, his exceptional feeling for the sonority of his instrument, his love of slow tempos, and his rich use of rubato and portamento. In the programme of the premiere Martinu described the concerto in some detail: ‘The idea for this concerto presented itself to me with the following order—Andante, a broad lyric song of great intensity which leads to a Poco allegro, exploiting the technique and the virtuosity of the instrument, and has the aspect of a single-movement composition. The definitive form complies with concerto structure. I have preserved its grave character, lyric in the first part, and even in the middle Allegro, the Andante theme returns to close the movement. The second part [Andante moderato] is a sort of point of rest, a bridge progressing towards the final Poco allegro. It is an intermezzo moderato, almost bucolic, accompanied by only a part of the orchestra and progressing attacca into the finale, which is Poco allegro. This movement favours the technique of the violin, which is interrupted by broad and massive tutti passages. The concerto ends with a sort of stretto, Allegro (vivo).’ In his general thoughts on violin concertos of the past that follows, Martinu distinguishes several types of use of the solo violin and clearly prefers those which emphasize ‘inherent beauty of tone’. According to Martinu’s programme notes for the premiere, the cadenza at the end of the first part was added subsequently at Elman’s suggestion. From Martinu’s letters to the Czech publisher Karel Šebánek it is obvious that he made some corrections to the score, probably in two stages. On 10 October 1947 he wrote: ‘I would like to make some changes in the cadenzas but I do not know where and whether to do so at all.’ More than a month later, on 18 November 1947, Martinu admitted to Šebánek that he had already ‘made some changes in the score after the premiere of the concerto’, and was not sure if the publisher had the corrected copy or not. The original manuscripts of the concerto (at least three are reported in the composer’s correspondence) and the handwritten piano reduction remain missing, so we cannot be certain whether these final revisions are included in the published version. The fact that Martinu later greeted the receipt of five printed scores sent to him on 3 December 1949, describing them as ‘splendid’, missing only the dedication to Mischa Elman, is offset by his well-known, rather cursory approach to proofreading. The premiere of the concerto took place in Boston on 31 December 1943, with the Boston Symphony conducted by Sergey Koussevitzky. Happily it was broadcast and much later released on CD—a priceless document that highlights the personal character of this concerto and how it was tailored to Mischa Elman. Elman retained exclusivity with this concerto for three years after its premiere, and performed it often. After his exclusivity expired in 1946 the concerto was taken up by several violinists; in a letter to Šebánek from 7 January 1947 Martinu mentions ‘a big interest in the concerto’, citing ‘the brilliant young violinist Isaac Stern’ as one of the musicians investigating the work. Other violinists who performed the concerto include Louis Kaufman, Bruno Bevlcík and especially Josef Suk, who performed this concerto many times and in 1978 received the Grand Prix du Disque de l’Académie Charles Cros for his recording with Václav Neumann and the Czech Philharmonic. Le Concerto no 1 pour violon et orchestre H226 de Bohuslav Martinu (originellement H232 bis, corrigé en H228/233) a une histoire très compliquée. En 1923, Martinu quitta Prague pour Paris où, dès le début des années 1930, il devint un compositeur fort réputé et respecté, dont les œuvres (opéras, ballets, pièces orchestrales et musiques de chambre) étaient jouées dans plusieurs villes européennes et américaines. Sa musique remporta des prix; des musiciens, des institutions musicales lui commandèrent des œuvres et, comme nul n’ignorait sa formation de violoniste (il fut même, pendant quelques années, membre de l’Orchestre philharmonique tchèque), ce n’était qu’une question de temps pour qu’on lui demandât un concerto pour violon. Cette requête émana du célèbre violoniste américain d’origine polonaise Samuel Dushkin qui, à l’été de 1931, avait inspiré à Igor Stravinsky un concerto pour violon et qui bénéficiait du soutien de Willy Strecker, le propriétaire des éditions Schott. Cette maison négociait alors avec Martinu un contrat d’exclusivité qui eût permis à ce dernier d’intégrer le cercle d’élite constitué de gens comme Paul Hindemith. (D’où la vaste correspondance entre Martinu et Strecker, qui nous permet de suivre presque pas à pas la création de ce concerto pour violon.) Mais la montée, en Allemagne, d’un national-socialisme abhorrant la musique dite «dégénérée» empêcha Schott de finaliser cette transaction éditoriale. Martinu avait rencontré Dushkin au début des années 1930, à Paris, où tous deux avaient alors élu domicile, et il l’avait entendu jouer le concerto pour violon de Stravinsky, sous la baguette de ce dernier. Toutefois, ce fut, semble-t-il, indépendamment de ce concert qu’il souhaita écrire un concerto pour Dushkin car, dès le 22 mai 1931, alors même que Stravinsky n’avait encore rien entrepris avec le violoniste, il avait écrit à Strecker son intention «de travailler avec Mr Dushkin à un concerto pour violon». Quatre mois plus tard, le 24 septembre 1931, il confia à Willy Strecker qu’il avait parlé à Dushkin et qu’il était «prêt à composer le concerto pour violon». Le 9 décembre 1931, le lendemain de son quarante et unième anniversaire, il annonça à Strecker que le concerto était fini et qu’il allait «l’examiner avec Mr Dushkin». Cette remarque nous montre bien que Martinu ne s’était pas encore rangé à l’idée de coopérer avec Dushkin, connu pour influencer les compositeurs avec lesquels il travaillait. Autant le pianiste Stravinsky prit cela fort bien—il souligna dans son autobiographie combien la disponibilité de Dushkin, sa capacité à prodiguer des conseils l’incitèrent à entreprendre son concerto pour violon—, autant pour le violoniste Martinu ce fut une expérience nouvelle, source de nombreuses difficultés. Pourtant, le 27 octobre, ce fut un Martinu encore plein d’espoir qui confia à Strecker: «le travail sur le concerto va bon train, Mr Dushkin est très content». Pour un compositeur comme lui, habitué à aller vite—en 1931, il acheva douze partitions et travailla sur le ballet Špalícek—, ce dut être un cauchemar de revenir sans cesse sur une œuvre qu’il tenait pour achevée. Quinze bons mois passèrent et, le 8 février 1933, il écrivit à sa famille, restée à Policka, qu’il avait accompli «beaucoup de travail sur le concerto pour Dushkin». Au bout de huit jours, il annonça en avoir fini avec cette œuvre, dont Dushkin était «fort content». Dushkin emporta le nouveau concerto aux États-Unis, où il chercha à le faire jouer—«très bientôt, probablement à Philadelphie», écrivit Martinu à se mère, le 9 juin 1933. Ce qui s’avéra un rien optimiste, comme nous le montre la lettre qu’il adressa le 27 juin à sa famille, toujours à Policka: «Dushkin va rentrer des États-Unis en août et il aimerait revoir une dernière fois le concerto». À cette époque, Stanislav Novák (ami intime de Martinu et premier violon de l’Orchestre philharmonique tchèque dirigé par Talich) se montra intéressé par l’idée de jouer le concerto à Prague mais Dushkin, voulant s’en charger lui-même, l’en empêcha. En septembre, Martinu rapporta que Dushkin était rentré à Paris et qu’il allait entreprendre avec lui «l’édition définitive du concerto». Quelques jours plus tard, l’intérêt manifesté par Novák ayant apparemment aiguillonné Dushkin, Martinu fit savoir à sa mère: «Dushkin va interpréter le concerto pour violon à Prague, probablement en janvier». Les éditions Schott furent priées d’envoyer le paiement de l’œuvre à Paris, ce qui laisse entendre que tout allait enfin se conclure. Or, là encore, il n’en fut rien, sûrement à cause des bouleversements politiques survenus dans l’Allemagne des années 1933 et 1934. D’autres premières envisagées avec Dushkin, notamment au Nouveau Théâtre allemand de Prague à l’automne de 1934, ne se concrétisèrent pas. Quatre ans plus tard, le violoniste empêcha Louis Krasner de jouer le concerto aux États-Unis (selon une lettre de Martinu à Strecker, le 4 mars 1938). Perdue, vraisemblablement durant la Seconde Guerre mondiale, lorsque Martinu dut cacher ses manuscrits autographes en Europe et s’enfuir aux États-Unis, la partition de ce concerto fut découverte en 1968 par Harry Halbreich dans les Archives Moldenhauer de la Northwestern University de Spokane (Washington). Mais l’œuvre ne fut pas créée avant le 25 octobre 1973, à Chicago, avec Josef Suk en soliste et Georg Solti à la tête du Chicago Symphony Orchestra. Le premier mouvement, Allegro moderato, révèle l’influence du jeu de Dushkin, surtout son goût pour la démonstration technique. La petite ouverture orchestrale, centrée sur mi, introduit la courte «cellule» (pour parler comme Martinu) motivique syncopée de six notes: cinq mi dans des registres différents et un bref ré. Le violon solo reprend la cellule principale dans un passage de bravoure tout en virtuosité (doubles, triples et quadruples cordes, harmoniques, etc.). Au fil du mouvement, de longs passages écrites en triples cordes et en arpèges brillants apparaissent comme les éléments les plus marquants. Martinu y dévoile sa profonde intelligence du violon, dont il avait appris à jouer la littérature virtuose dans son enfance, à Policka. On peine à démêler sa propre expertise d’éventuels desiderata de Dushkin, même si les passages où le violon imite presque une guitare reflètent sûrement davantage des idées de Dushkin que ne le font les passages lyriques et mélodiques, typiques de Martinu. Ce qui est inhabituel pour lui, c’est le vaste espace accordé aux variations de la cellule liminaire: il faut attendre le milieu du mouvement pour que soit introduit un motif contrastif, dans un doux mi mineur, où le violon chante, en une longue phrase, une mélodie remarquablement belle et simple, dans le style d’un chant populaire morave. Pour souligner le changement d’atmosphère, l’accompagnement passe d’un staccato orchestral à des trémolos aux cordes. À l’issue de cette section brévissime (vingt-deux mesures) mais importante, le violon solo est rejoint par un violoncelle. La reprise suivante, qui revient presque littéralement au matériel de la section inaugurale, est d’abord en la mineur pour finir dans le ton principal de mi mineur. Le deuxième mouvement, Andante, repose sur une ample cantilène, stylistiquement fort proche de Špalícek (H214), le ballet populaire composé par Martinu à la même époque. Sa ligne mélodique pendulaire s’appuie sur l’alternance d’une tonalité centrale avec ses notes supérieures et inférieures, essentiellement à une quarte d’intervalle. Le mouvement conclusif est un Allegretto (même si cette désignation, absente du manuscrit original, fut un ajout de ceux qui préparèrent l’édition du concerto, à savoir le violoniste Josef Suk, le chef d’orchestre Zdenek Košler et le spécialiste de Dvorák Jarmil Burghauser). Il démarre attacca avec la courte cellule thématique principale, toujours aussi brève—elle compte seulement cinq notes, un si bémol et quatre la, cette fois non répartis sur différentes octaves. Mélodiquement, la section orchestrale liminaire perpétue le caractère à la Špalícek du deuxième mouvement. Mais l’entrée du violon solo, à l’écriture richement ornée, porte de nouveau la griffe de Dushkin. Sa ligne mélodique simple, décorée de plusieurs appoggiatures, est étonnamment vite interrompue par une série de courtes cadenzas solo pour le violon, dans l’une desquelles Martinu opère un très original amalgame entre le violon solo et la caisse claire—un timbre singulier qu’il reprendra des années plus tard, dans le dernier mouvement de sa Suite concertante H276 (commandée, elle aussi, par Dushkin; cf. vol. 3) et dans ses Phantaisies symphoniques (Symphonie no 6), H343. Par son style comme par son histoire, le Concerto pour violon no 2, H293 diffère totalement du premier. Il fut commandé par Mischa Elman (1891–1967), célèbre violoniste américain d’origine ukrainienne, ancien enfant prodige et élève de Brodsky, à Odessa, mais aussi de Leopold Auer, à Saint-Pétersbourg. Il fit ses débuts berlinois et londoniens avant même que Martinu, pourtant de deux mois son aîné, intégrât le Conservatoire de Prague. Ami et farouche défenseur de Martinu, Miloš Šafránek raconte dans son biographie (1944) comment Elman, venu au Carnegie Hall dans l’espoir d’entendre le Boston Symphony Orchestra jouer la Symphonie no 7 de Chostakovitch, se retrouva à la première new-yorkaise de la Symphonie no 1 de Martinu, au début de janvier 1943. Après l’écrasant succès de cette œuvre, Elman alla trouver le compositeur, devenu célèbre du jour au lendemain aux États-Unis, afin de lui demander un concerto pour violon. Leur rencontre dut être intéressante: difficile, en effet, d’imaginer plus opposés que ce soliste, dont les activités étaient centrées sur les répertoires du XVIIIe siècle (Vivaldi, Bach) et du XIXe siècle (Beethoven, Schubert, Wieniawski, Tchaïkovsky, Dvorák), et ce compositeur qui avait vécu à Paris, l’un des principaux centres de la musique contemporaine. Il n’est guère étonnant que leurs chemins ne se soient pas croisés plus tôt. Dans le programme qu’il rédigea pour la création du Concerto no 2, Šafránek évoque les circonstances de cette première rencontre: «Le parler monosyllabique de Martinu déroutait Elman, qui tenta de briser la glace en lui demandant s’il avait déjà entendu l’un des violonistes mondialement connus. “Non”, fut la réponse. “Connaîtriez-vous par hasard mon jeu?”, se risqua alors Elman. “Non”, répliqua Martinu d’une voix éteinte. Il y eut un long silence. Finalement, Elman essaya de s’en tirer en emmenant Martinu a son studio, où il joua pour lui pendant une demi-heure environ. Le compositeur écouta, très attentif mais totalement impassible. Après la dernière note, Elman, fort naturellement, se leva et attendit sa réaction. Mais Martinu resta assis dans un silence de sphinx, qui ne fut rompu que quand il se leva à son tour pour prendre congé; les deux musiciens s’adressèrent un au revoir embarrassé. Complètement décontenancé, le violoniste craignait que son projet ne tournât au fiasco. Mais, peu après, Martinu apparut avec, comme prévu, la partition achevée d’un nouveau concerto pour violon.» Cette anecdote, plusieurs artistes, dont Louis Moyse, la corroborèrent, affirmant avoir vécu des expériences similaires. Composé en seulement deux mois (23 février–26 avril 1943) à New York City, où Martinu vivait, ce concerto rappelle les qualités de jeu de Elman, surtout sa sonorité unique, sa prédilection pour les mélodies nobles et élégantes, son exceptionnelle sensibilité au son du violon, son amour des tempos lents, mais aussi son riche usage du rubato et du portamento. Dans le programme de la première, Martinu détailla un peu son œuvre: «Ce Concerto me vint dans l’ordre suivant: Andante, un vaste chant lyrique très intense qui mène à un Poco allegro, exploitant la technique et la virtuosité de l’instrument, et a l’aspect d’une composition en un mouvement. La forme définitive obéit à la structure du concerto. J’ai préservé son caractère grave, lyrique dans la première partie et même dans l’Allegro central le thème de l’Andante revient clore le mouvement. La deuxième partie [Andante moderato] est comme une pause, un pont menant au Poco allegro final. C’est un intermezzo moderato presque bucolique, accompagné par une partie de l’orchestre et évoluant attacca dans le finale, qui est Poco allegro. Ce mouvement privilégie la technique du violon, interrompu par d’amples et massifs passages tutti. Le concerto s’achève sur un genre de strette, Allegro (vivo).» S’ensuivent des généralités sur les concertos pour violon du passé, où Martinu distingue différents usages du violon solo, avec une nette préférence pour ceux qui mettent l’accent sur la «beauté sonore intrinsèque». Dans les notes de programme qu’il rédigea pour la création de cette œuvre, Martinu précise que la cadenza à la fin de la première partie fut ajoutée après coup, suivant le conseil d’Elman. Ses lettres à l’éditeur tchèque Karel Šebánek nous apprennent que Martinu retoucha sa partition, probablement en deux étapes. Le 10 octobre 1947, il écrivit: «Je voudrais apporter quelques modifications aux cadenzas mais je ne sais pas où les faire, ni même s’il faut les faire.» Le 18 novembre 1947, il avoua à Šebánek qu’il avait déjà «changé un peu la partition après la première du concerto» mais il n’était pas sûr que l’éditeur ait eu l’exemplaire corrigé. Tant que nous n’aurons pas les manuscrits originaux du concerto (la correspondance du compositeur en mentionne au moins trois) et de sa réduction pianistique, nous ne pourrons affirmer que ces ultimes révisions figurent bien dans la version publiée. Le fait que Martinu se réjouît, par la suite, d’avoir reçu cinq «splendides» partitions imprimées expédiées le 3 décembre 1949 (seule manquait la dédicace à Elman) est contrebalancé par son approche plutôt superficielle de la correction d’épreuves. Le concerto fut créé à Boston le 31 décembre 1943 par le Boston Symphony Orchestra placé sous la direction de Sergueï Koussevitzky. Par bonheur, cet événement fut radiodiffusé et, bien plus tard, gravé sur CD—un document inestimable d’où ressort le caractère personnel de ce concerto écrit sur mesure pour Mischa Elman. Ce dernier le joua souvent pour en avoir détenu l’exclusivité pendant les trois années qui suivirent sa création. Passé ce délai, en 1946, plusieurs violonistes s’en emparèrent; dans une lettre à Šebánek (7 janvier 1947), Martinu évoqua «un vif intérêt pour le concerto», citant «le jeune et brillant violoniste Isaac Stern» parmi les musiciens qui l’étudiaient. D’autres violonistes l’interprétèrent, tels Louis Kaufman, Bruno Bevlcík et, surtout, Josef Suk, qui le joua maintes fois et reçut en 1978 le Grand Prix du disque de l’Académie Charles Cros pour l’enregistrement qu’il réaliser avec Václav Neumann et l’Orchestre philharmonique tchèque. Martinus Konzert Nr. 1 für Violine und Orchester H226 (recte H228/233, ursprünglich H232 bis) hat eine sehr komplizierte Geschichte. In den frühen 1930er Jahren war Bohuslav Martinu in Paris schon wohletabliert, wo er 1923 aus Prag angekommen war. Er hatte sich mit Aufführungen seiner Opern, Ballette, Orchesterwerke und Kammermusik in diversen europäischen Städten und in den USA einen sehr guten Ruf als Komponist erworben. Seine Musik wurde mit Preisen ausgezeichnet, und er erhielt von sowohl Musikern als auch Musikorganisationen Kompositionsaufträge für neue Werke. Da es weithin bekannt war, dass Martinu ursprünglich die Violine gespielt hatte (einige Jahre lang sogar als Orchestermusiker in der Tschechische Philharmonie) war es nur eine Frage der Zeit, wann er einen Auftrag für ein Violinkonzert erhalten würde. Der Auftrag kam von dem gefeierten, in Polen geborenen, amerikanischen Violinisten Samuel Dushkin, dem Mann, der im Sommer 1931 Strawinsky zur Komposition eines Violinkonzerts angeregt hatte, und fand vom Verleger Willy Strecker, dem Besitzer des Verlagshauses Schott, Unterstützung. Der Auftrag erfolgte zu einem Zeitpunkt, als Schott mit Martinu über einen Exklusivvertrag verhandelte, der den Komponisten dank einer so umfassenden Verlagsvereinbarung in eine Elitetruppe von Komponisten neben solche Größen wie Paul Hindemith gestellt hätte. (Das erklärt den umfangreichen Briefwechsel zwischen Martinu und Strecker, der uns hilft, die Entstehung des Violinkonzerts fast Schritt für Schritt nachzuvollziehen.) Nur der Aufschwung der nationalsozialistischen Politik in Deutschland mit ihrer Abneigung gegen sogenannte „entartete Musik“ hinderte Schott von der Unterzeichnung des Vertrags. Martinu kannte Dushkin aus Paris, wo sie beide in den frühen 1930er Jahren gelebt hatten. Der Komponist wurde dem Violinisten im Zusammenhang mit Dushkins Aufführung von Strawinskys Violinkonzert vorgestellt, in der Strawinsky selbst dirigierte. Doch scheint Martinus Wunsch, ein Konzert für Dushkin zu schreiben, unabhängig entstanden zu sein, denn schon am 22. Mai 1931, also bevor Strawinsky mit Dushkin zu arbeiten begann, erwähnte Martinu in einem Brief an Willy Strecker seinen Plan, „mit Herrn Dushkin an einem Violinkonzert zu arbeiten“. Vier Monate später, am 24. September 1931 bestätigte Martinu gegenüber Strecker, er habe mit Dushkin gesprochen und sei bereit, „mit der Komposition des Violinkonzerts zu beginnen“. Am 9. Dezember 1931, ein Tag nach seinem 41. Geburtstag, berichtete Martinu Strecker, dass das Konzert fertig sei und er es „mit Herrn Dushkin durchsehen werde“. Mit dieser Bemerkung wird deutlich, dass Martinu Dushkins Vorstellung von einer Zusammenarbeit an einem neuen musikalischen Werk noch nicht zu schätzen wusste. Dushkin hatte den Ruf, die Komponisten, mit denen er zusammenarbeitete, aktiv zu beeinflussen. Während das Strawinsky, ein Pianist, sehr willkommen hieß—er schrieb in seiner Autobiographie, er habe den Auftrag für ein Violinkonzert unter anderem nur deshalb angenommen, weil Dushkin mit Rat zur Verfügung stand—war das für den Violinisten Martinu eine neue Erfahrung und verursachte eine Menge Schwierigkeiten. Am 27. Oktober war Martinu aber immer noch ziemlich hoffnungsvoll. Er schrieb Strecker, dass „die Arbeit am Konzert sehr gute Fortschritte macht, Herr Dushkin ist sehr zufrieden“. Für einen Komponisten, der es gewöhnt war, schnell zu schreiben—1931 schloss er zwölf Kompositionen ab und arbeitete am Ballett Špalícek—muss es ein Alptraum gewesen sein, immer wieder zu einem Stück zurückzukehren, das er als abgeschlossen betrachtete. Mehr als 15 Monate später, am 8. Februar 1933, schrieb Martinu an seine Verwandten in Policka, er habe „eine Menge Arbeit in das Konzert für Dushkin gesteckt“. Acht Tage später berichtete er, das Werk sei abgeschlossen und Dushkin „sehr glücklich“ damit. Dushkin nahm das neue Konzert mit in die USA und suchte nach Möglichkeiten zur Aufführung—„sehr bald, wahrscheinlich in Philadelphia“ laut Martinu (in einem Brief an seine Mutter, 9. Juni 1933). Das erwies sich allerdings als allzu optimistisch, wie man es aus einem Brief des Komponisten vom 27. Juni an seine Familie in Policka nachlesen kann, wo Martinu schreibt: „Dushkin wird im August aus den USA zurückkehren und würde gern eine letzte Änderung am Konzert vornehmen“. Zu diesem Zeitpunkt zeigte Martinus enger Freund Stanislav Novák, Konzertmeister in der Tschechische Philharmonie unter Talich, Interesse an einer Aufführung des Konzerts in Prag. Aber Martinu verweigerte ihm seine Zustimmung, da er selber vorhatte, das Werk dort zu spielen. Im September berichtete Martinu von Dushkins Rückkehr nach Paris. Dort sollten sie „die letzte Änderung des Konzerts“ vornehmen. Ein paar Tage später scheint es, als ob Nováks Interesse an einer Aufführung Dushkin aufgerüttelt habe, denn Martinuo schreibt seiner Mutter: „Dushkin wird das Violinkonzert in Prag aufführen, wahrscheinlich im Januar.“ Schott wurde gebeten, das Honorar für das Konzert nach Paris zu schicken, was darauf schließen lässt, dass endlich alles zum Abschluss kommen sollte. Doch erneut geschah nichts, wahrscheinlich aufgrund der politischen Umwälzung in Deutschland 1933 und 1934. Weitere vorgeschlagene Uraufführungen des Konzerts mit Dushkin, einschließlich einer Aufführung am Neuen deutschen Theater in Prag im Herbst 1934, kamen nicht zustande. Vier Jahre später hinderte Dushkin Louis Krasner an einer Aufführung des Werkes in den Vereinigten Staaten (laut eines Briefes von Martinu an Strecker, 4. März 1938). Die Partitur des Konzerts ging dann verloren, wahrscheinlich während des Zweiten Weltkrieges, als Martinu gezwungen war, seine Partituren in Europa zu verstecken und in die USA zu fliehen. Sie wurde 1968 von Harry Halbreich im Moldenhauer Archiv an der Northwestern University of Spokane (Washington) wiederentdeckt. Erst am 25. Oktober 1973 erlebte das Konzert seine Uraufführung, in Chicago, mit Josef Suk als Solisten und Georg Solti als Dirigenten des Chicago Symphony Orchestra. Der erste Satz, Allegro moderato, lässt den Einfluss von Dushkins Violinspiel erkennen, besonders dessen Neigung zu virtuoser Schaustellung. Die kurze Orchestereinleitung, die sich um E dreht, stellt die kurze, synkopierte, motivische „Zelle“ (wie sie der Komponist beschrieb) vor, die aus sechs Noten besteht, von denen fünf ein E in jeweils unterschiedlichen Oktaven sind (und die andere Note ein kurzes D ist). Die Solovioline übernimmt die Hauptzelle in einer virtuosen Passage voller Doppel-, Tripel- und Quadrupelgriffe, Flageoletts und anderer virtuoser Kniffe. Im Verlauf des Satzes erweisen sich lange Passagen gefüllt mit vollen Tripelgriffen und leuchtenden Arpeggios als die wichtigsten Elemente. Martinu offenbart hier seine enge Vertrautheit mit der Violine und seine Kenntnis der virtuosen Violinliteratur, die er als Junge in Policka zu spielen gelernt hatte. Es ist schwierig, sein eigenes im Hintergrund wirkendes Wissen von eventuellen speziellen Wünschen Dushkins zu unterscheiden. Zu Dushkins Ideen gehören aber wahrscheinlich eher die Passagen, in denen die Violine fast eine Gitarre nachahmt, als die lyrischen und melodischen Passagen, die typisch für Martinus Schaffen sind. Ziemlich ungewöhnlich für Martinu ist der riesige Raum, den er den Variationen der einleitenden Zelle widmet. Erst in der Satzmitte führt er ein kontrastierendes Motiv ein, in einem milden e-Moll, wo die Violine in einem langen Bogen eine Melodie von außergewöhnlicher Schönheit und Einfachheit im Stile eines mährischen Volkslieds singt. Um den Stimmungswechsel zu unterstreichen, wechselt die Begleitung von einem Staccato des gesamten Orchesters zu Tremoli in den Streichern. Am Ende dieses extrem kurzen aber wichtigen Abschnitts (nur 22 Takte) gesellt sich ein Solocello zur Melodie der Solovioline. Die darauf folgende Reprise kehrt fast notengetreu zum Material des Anfangsabschnitts zurück, zuerst in a-Moll, dann abschließend in der Grundtonart e-Moll. Der zweite Satz, Andante, stützt sich auf eine breite Kantilene und steht stilistisch dem ungefähr gleichzeitig entstandenen Ballett im Volkston Špalícek H214 sehr nahe. Die schaukelartige melodische Linie dieser Kantilene beruht auf dem Schwingen zwischen einem zentralen Ton und darüber bzw. darunter liegenden Noten, meistens im Intervallabstand einer Quarte. Der letzte Satz ist ein Allegretto (auch wenn diese Anweisung nicht in der originalen handschriftlichen Partitur vorkommt, sondern von den Redakteuren des Konzerts, dem Violinisten Josef Suk, dem Dirigenten Zdenek Košler und dem Dvorák-Kenner Jarmil Burghauser hinzugefügt wurde). Dieser Satz folgt attacca auf den vorangegangenen und beginnt mit einer neuen kurzen Hauptthemenzelle. Wie im ersten Satz ist sie sehr kurz. Hier besteht sie aus nur fünf Noten, von denen vier ein A sind (und die übrige Note ein B ist), diesmal nicht auf unterschiedliche Oktaven verteilt. Melodisch setzt der einleitende Orchesterabschnitt mit dem Špalícek-Charakter des zweiten Satzes fort. Der großzügig umrankte Einsatz der Solovioline lässt wiederum den Einfluss Dushkins erkennen. Die einfache melodische Linie wird mit diversen Vorschlägen verziert. Dieser Abschnitt wird überraschend schnell von einer Reihe kurzer Solokadenzen der Violine unterbrochen, und in einer von ihnen kombiniert Martinu die Solovioline auf äußerst originelle Weise mit der kleinen Trommel—er grifft viele Jahre später, im letzten Satz der Suite concertante H276 (ebenfalls ein Auftragswerk von Dushkin, siehe Band 3) wie auch in seiner Phantaisies symphoniques (Sinfonie Nr. 6) H343, wieder auf diese auffällige Klangfarbe zurück. Das Violinkonzert Nr. 2 H293 unterscheidet sich in jeder Hinsicht von seinem Vorgänger, stilistisch wie auch hinsichtlich seines Schicksals. Das Werk wurde von Mischa Elman (1891–1967), einem berühmten amerikanischen Violinisten ukrainischer Herkunft, einem ehemaligen Wunderkind und Studenten von Brodsky in Odessa und Leopold Auer in St. Petersburg, in Auftrag gegeben. Elman wurde zwar nach Martinu geboren (wenn auch nur zwei Monate), seine Debüts in Berlin und London gab er allerdings schon, noch bevor der Komponist am Konservatorium in Prag zu studieren begann. Miloš Šafránek, ein Freund und unbeirrbarer Förderer Martinus, berichtete in seiner Biographie von 1944, wie Elman Anfang Januar 1943 ein Konzert des Boston Symphony Orchestra in der Carnegie Hall besucht habe in der Hoffnung, Schostakowitsch’ Sinfonie Nr. 7 zu hören. Stattdessen befand er sich in der New Yorker Erstaufführung von Martinus Sinfonie Nr. 1. Nach dem überwältigenden Erfolg dieser Sinfonie, der Martinu fast über Nacht in den USA berühmt werden ließ, besuchte Elman den Komponisten und bat ihn, ihm ein Violinkonzert zu schreiben. Das muss ein interessantes Treffen gewesen sein, da man sich kaum einen größeren Kontrast zwischen den Aktivitäten des Solisten, der sich hauptsächlich auf Repertoire des 18. Jahrhunderts (Vivaldi, Bach) und besonders des 19. Jahrhunderts (Beethoven, Schubert, Wieniawski, Tschaikowsky, Dvorák) konzentrierte, und dem Komponisten vorstellen, der in Paris gelebt hatte, einem der wichtigsten Zentren zeitgenössischer Musik. Es ist kein Wunder, dass sich die Wege von Martinu und Elman nicht schon früher gekreuzt hatten. Im Programmheft der Uraufführung des Violinkonzerts Nr. 2 erinnert sich Šafránek an die Umstände der ersten Begegnung zwischen dem Komponisten und dem Violinisten: „Martinus kurz angebundene Art verwunderte Elman, der versuchte, das Eis zu schmelzen, indem er sich erkundigte, ob jener einen lebenden weltberühmten Violinisten gehört habe. „Nein“, gab der zur Antwort. „Haben sie mich zufällig schon mal spielen gehört?“, wagte sich Elman vor. „Nein“, sagte Martinu ausdruckslos. Es folgte eine längere Pause. Schließlich versuchte Elman das Problem zu lösen, indem er Martinu in sein Studio einlud und ihm eine halbe Stunde oder so etwas vorspielte. Der Komponist hörte sehr aufmerksam zu, wenn auch ohne Anteilnahme jeglicher Art. Nach der letzten Note stand Elman nur allzu verständlich da und wartete auf eine Reaktion. Doch Martinu hüllte sich weiterhin wie eine Sphinx in Schweigen, das erst gebrochen wurde, als er aufbrach und sich beide Musiker verlegen verabschiedeten. Der Violinist war völlig perplex und fürchtete, sein Plan sei nicht aufgegangen. Doch nicht lange danach tauchte Martinu ordnungsgemäß mit der fertigen Partitur eines neuen Violinkonzerts auf.“ Diese Anekdote wird von einigen anderen Künstlern—unter ihnen auch Louis Moyse—bestätigt, die von ähnlichen Erfahrungen in ihrem Umgang mit dem Komponisten berichteten. Martinu komponierte das Konzert in nur zwei Monaten, vom 23. Februar bis zum 26. April 1943, in seiner Wohnung in New York City. Die wichtigsten Merkmale des Werkes rufen Elmans interpretatorische Charakterzüge in Erinnerung, besonders seinen einzigartigen Klang, seine Vorliebe für noble und elegante Melodien, sein außergewöhnliches Gefühl für den Ton seines Instruments, seine Liebe zu langsamen Tempi und sein großzügiger Einsatz von rubato und portamento. Im Programmheft der Uraufführung beschrieb Martinu das Konzert in einigen Einzelheiten: „Die Idee für dieses Konzert kam mir in der folgenden Reihenfolge—Andante, ein breites lyrisches Lied von großer Emotionalität, das zu einem Poco allegro führt, welches die spieltechnischen und virtuosen Möglichkeiten des Instruments auslotet, und in gewisser Hinsicht eine einsätzige Form anstrebt. Die übergreifende Form entspricht jedoch der Konzertgattung. Ich habe den gesetzten Charakter beibehalten: Das Thema des Andante, lyrisch im ersten Teil, ja selbst im zentralen Allegro; kehrt am Ende wieder zurück und beschließt den Satz. Der zweite Teil [Andante moderato] ist eine Art Ruhepunkt, eine Brücke, die zum abschließenden Poco allegro führt. Dieser Teil gleicht einem Intermezzo moderato, fast ländlich, und wird nur von einem Teil des Orchesters begleitet. Er geht attacca in den mit Poco allegro überschriebenen Schlussteil über. Dieser Abschnitt hebt die Virtuosität des Violinisten hervor, der von breiten und massiven Tuttipassgen unterbrochen wird. Das Konzert endet mit einer Art Stretta, Allegro (vivo).“ In den darauf folgenden allgemeinen Reflektionen über Violinkonzerte der Vergangenheit unterscheidet Martinu verschiedene Verwendungsarten der Violine und zieht eindeutig jene vor, die die „inhärente Schönheit des Tons“ hervorheben. Laut Martinus Programmhefteinführung für die Uraufführung wurde die Kadenz am Ende des ersten Teils später auf Anraten Elmans hinzugefügt. Aus Martinus Briefen an den tschechischen Verleger Karel Šebánek geht hervor, dass der Komponist einige Änderungen an der Partitur vornahm, wahrscheinlich in zwei Etappen. Am 10. Oktober 1947 schrieb Martinu: „Ich möchte gern einige Änderungen an den Kadenzen vornehmen, weiß aber ich nicht, wo und ob ich es überhaupt tun sollte.“ Mehr als einen Monat später, am 18. November 1947 gestand Martinu Šebánek, er habe schon „einige Änderungen an der Partitur nach der Uraufführung des Konzerts vorgenommen“ und wäre sich nicht sicher, ob der Verleger die berichtigte Partitur habe oder nicht. So lange die originalen handschriftlichen Partituren des Konzerts (mindestens drei werden im Briefwechsel des Komponisten erwähnt) und der handschriftliche Klavierauszug verschollen sind, können wir nicht sicher sein, ob diese letzten Änderungen in der gedruckten Fassung enthalten sind. Die Tatsache, dass Martinu den Erhalt der ihm am 3. Dezember 1949 zugeschickten fünf gedruckten Partituren begrüßte und sie mit Einschränkung der fehlenden Widmung an Elman als „hervorragend“ beschrieb, wird durch seinen wohlbekannten eher flüchtigen Ansatz beim Korrekturlesen relativiert. Die Uraufführung des Konzerts fand am 31. Dezember 1943 in Boston durch das Boston Symphony Orchestra unter Serge Kussewitzky statt. Zum Glück wurde es gesendet und später auf CD veröffentlicht, ein äußerst wertvolles Dokument, das den persönlichen Charakter dieses Konzerts hervorhebt und zeigt, wie es Mischa Elman auf den Leib geschneidert wurde. Elman verfügte drei Jahre lang nach der Uraufführung Ausschließlichkeitsrecht zur Aufführung des Werkes und spielte es häufig. Nach dem Auslaufen seines Ausschließlichkeitsrechts 1946 nahmen sich diverse andere Violinisten des Werkes an; in einem Brief an Šebánek vom 7. Januar 1947 erwähnt Martinu ein „großes Interesse am Konzert“ und führt „den brillanten jungen Violinisten Isaac Stern“ als einen der Musiker an, die das Werk studierten. Zu den anderen Violinisten, die das Werk aufführten, gehören Louis Kaufman, Bruno Bevlcík und besonders Josef Suk, der dieses Konzert viele Male spielte und 1978 für seine Einspielung mit Václav Neumann und der Tschechische Philharmonie den Grand Prix du Disque de l’Académie Charles Cros erhielt.